ABC Classics is proud to unveil a new recording from Australia's finest orchestra, the Melbourne Symphony Orchestra, featuring conductor Sir Andrew Davis (appointed Chief Conductor of the MSO in 2013), and Canadian soprano Erin Wall. This is the first release in a Sir Andrew Davis' Strauss cycle for ABC Classics. Sir Andrew takes the listener on a journey through the ardour and heroics of the world's greatest lover as imagined in Strauss' Don Juan, and a delightful Four Last Songs with the amazing soprano Erin Wall, the artists working hand-in-glove. Rounding off this first offering is the awe-inspiring Also sprach Zarathustra, a work of massive scope, consummately performed here by orchestra and conductor. 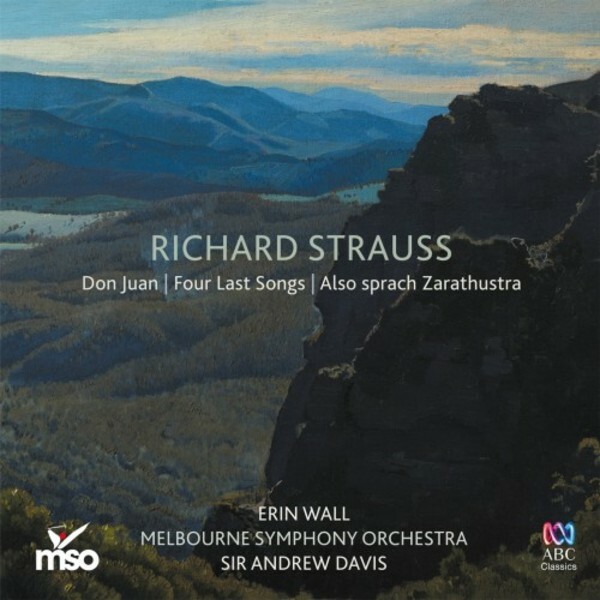 Erin Wall delivers a truly radiant account of Strauss' Four Last Songs with an atmosphere of quiet rapture rather than melancholy. She's an exciting young soprano with repertoire encompassing Mozart's Donna Anna through to most recently Strauss' Arabella for the Metropolitan Opera. Wall's voice is a glorious instrument - free, full, creamy and rich toned, with musicianship and control in abundance. With Andrew Davis' mastery of the Straussian ebb and flow, together they deliver a sublime performance where her voice, at times, almost merges with the orchestral textures (especially in 'Im Abendrot'), the MSO responding superbly to Strauss' delicate orchestrations, under the maestro's baton.